EngineerSupply is proud to carry quality Luxor Furnishings products. Luxor manufacturers some of the best utility carts on the market today. 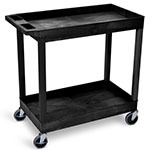 Luxor designs their heavy duty rolling utility carts with heavier capacities and heavy duty casters Luxor makes Whiteboards for Classrooms, Glassboards, Black Marker Boards, Stand Up Desks, LCD TV Carts, Utility Carts, Rolling Utility Carts, Steel Rolling Carts, Office Storage, and Presentation Stations.